Temecula Valley Southern California Wine Country introduces rosés for spring celebrations and dining, and offers samples at the California Wine Festival on April 26, 2016. America has fallen in love with rosé wines, one of the fastest growing segments of the US wine market. Popularized in the South of France, rosé is now made in every major wine region around the world, including Southern California’s premier wine region, the Temecula Valley. As a matter of fact, wineries here have been making rosés for decades – Hart Winery made its first pink wine, a Rosé of Grenache, in 1980, the year the winery opened! Sparkling rosé is always a wonderful way to start a gathering of any kind. Award-winning South Coast Winery produces four fabulous pink sparklers including their NV Blanc de Noir, a classic dry style, and the popular Ruby Cuveé with a touch of berry-filled sweetness. Not to be outdone, Thornton Winery has been creating sparkling wines for many years and features several sparkling rosés on its extensive list, as do Oak Mountain Winery, Wiens and Wilson Creek wineries. These high-quality blushing bubblies fall in the $19 to $38 price range. The region of Provence, in the south of France, is the benchmark for traditional, dry, food-friendly rosé. That tradition is alive and well in Temecula, with many of the wineries emulating this classic style, approachably priced at an average of $22. Hart Winery has a delightful Rosé of Tempranillo, or venture next door and try Callaway Vineyard & Winery’s Rosé of Sangiovese – it’s won a bevy of awards since its initial 2008 vintage. Travel down Rancho California Road and sample Miramonte Winery’s Rosé, made from a blend of typical Mediterranean grape varieties: Grenache, Cinsault and Syrah. Oak Mountain Winery, on the DePortola Trail, produces several variations on the Rosé theme, including their multiple-award-winning 2013 River Rhodes Rosé made with 100% Syrah. Or enjoy a bottle of Vindemia Winery’s Vermeille Grenache 2013, a lovely single-varietal pink wine. A craving for something sweet or off-dry can be fulfilled by the Pink Crowded rosé at Wiens Winery, an off-dry blend of Grenache, Zinfandel and Malbec. Or one can reach for White Zinfandel or White Merlot at Bel Vino, or relax in the gardens of Europa Village while sipping on a cool, refreshing glass of Garnacha Rosa. Any of these choices would be stellar matches to a wide range of foods. Dry rosé is fantastic with flavorful appetizers such as tapenade, flatbreads, charcuterie platters, hummus, and soft cheeses like chèvre and brie. When it comes to main courses, one can pop the cork on another bottle of rosé and enjoy it with pizza, a variety of fish or poultry dishes, salads, light meats like pork or ham, or a good, juicy burger! Off-dry styles are wonderful with firmer cheeses such as Parmesan and aged gouda. Or rosé fans can sample a sip with a strawberry and spinach salad. And, of course, there’s always room for dessert, with a glass of sweet style rosé! Any food can be paired featuring berries, peaches, nectarines or spicy ginger with Irresistable Rosato from Falkner Winery (crafted from Sangiovese and Cabernet Sauvignon) or Sara Bella White Cabernet Sauvignon from one of Temecula’s more established wineries, Maurice Car’rie. Temecula Valley vintners are bottling their rosé wines from the fantastic 2015 vintage now, in early 2016. These wines are made to be consumed fresh, upon release. 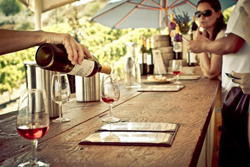 Temecula Valley visitors can grab a picnic blanket, fire up the grill or unfurl their finest white tablecloth and get ready for superb sampling of refreshing, scintillating rosé from the wineries of Temecula Valley Southern California Wine Country. With dozens of delicious choices to sample, visitors need to reserve a room and stay awhile! A variety of hotels and resorts are available for mid-week stay to enjoy a relaxed, carefree wine tasting experience and potential visit with a winery owner or winemaker. A list of overnight accommodations and things to do can be found at VisitTemeculaValley.com. Editor’s Note: Come sample Temecula Valley rosés at the California Wine Festival in Orange County on April 16. Visit Temecula Valley is the official tourism marketing organization and resource for visitors in the Temecula Valley Southern California region. The Temecula Hotel Tourism Improvement District is the primary source of funding for Visit Temecula Valley activities and programs. Additional funding is provided through alliances with visitor-serving partners throughout Temecula Valley. Visit Temecula Valley is online at VisitTemeculaValley.com. The Temecula Valley Visitors Center is located in Downtown, Old Town Temecula (Third Street and Mercedes) adjacent the Old Town Temecula Parking Garage. For visitor information and assistance, please call 888-363-2852 or 951-491-6085.